Jake is a native of Utah and graduated from the University of Utah with a Bachelors of Science in Sociology in 1999. Jake’s major strength has always been his ability to build strong, trusting relationships. This strength helped him excel in his pursuits in business development and marketing in industries as diverse as publishing, executive search, lending, and real estate. He first became involved in the real estate industry in 2005 when he moved to Phoenix with his wife and family. He worked two years as an apprentice residential real estate appraiser, developing a keen insight into the valuation process and the complexities of the Phoenix market. He also worked a year in the lending industry. In 2011, Jake obtained a real estate license and found immediate success as an acquisition specialist for investors and as a resale specialist that helps clients purchase and sell homes. Jake and his wife Karolee have been married for 18 years and have five beautiful children. Jake is very active in his community; he teaches Sunday School classes at his church and has volunteered for several local charities. Outside of real estate, Jake is passionate about fitness, nutrition, personal development, music, and design. 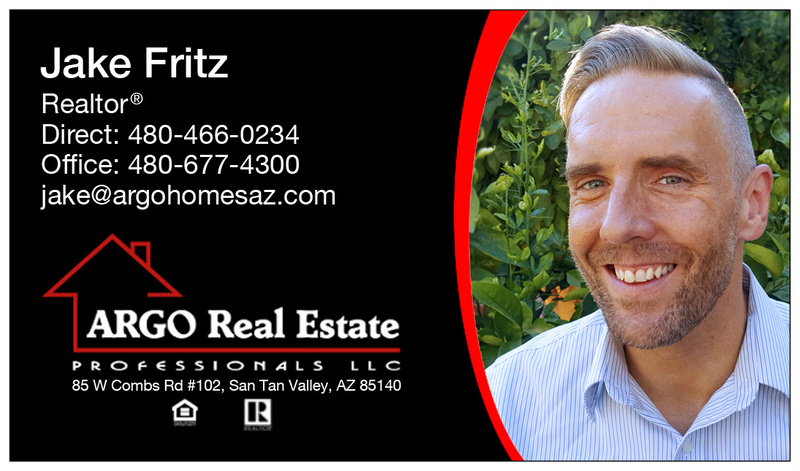 HOT San Tan Valley Homes! !